When you join the club, you will receive a Gi and a white belt. 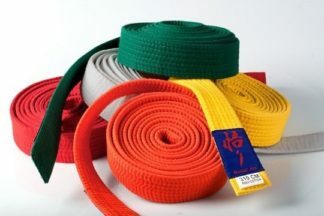 You will then learn the syllabus for 9th Kyu which means you will be working towards your first grading for a Red Belt. You will need to attend a minimum of 10 lessons to qualify to grade for 9th Kyu. Your Senseis will make sure you are properly prepared to grade, and you will never be entered for a grading unless you are ready both physically and mentally. The amount of work you put into practicing outside the Dojo will determine how effective your training is, and therefore how quickly you will be able to move up the grades, progressing ultimately towards the goal of attaining a coveted Black belt at a Dan grading. Dan gradings take place before a panel of 3 senior Senseis. You will need to train for at least 6 months before attempting 1st Dan , then 2 years for 2nd Dan, 3 years for 3rd dan all the way up to 10 years training for 10th Dan!!! The syllabus generally is split into 3 sections Kihon, Kata and Kumite. Kihon – means basics or fundamentals. The practice and mastery of Kihon is essential to all advanced training. It includes the development of correct body form and breathing whilst practicing basics such as stances, punches, kicks, blocks and thrusts.Kihon techniques need to be practiced often and are fundamental to mastery and improvement of all complex movements. Kata - literally means form. Kata describes detailed choreographed patterns of movement, practiced solo, in pairs or in teams of more than two. Katas are executed as a specified series of approximately 20 to 70 moves, generally with stepping and turning, whilst attempting to maintain perfect form. The study of the meaning of the movements is referred to as Bunkai. Kumite – means meeting of the hands. Kumite is the part of your syllabus which trains you to spar against an adversary, using techniques learned in the Kihon and Kata sections. You will be expected to be controlled at all times and excessive contact will be penalised.